Readers of novels seem to have a natural, almost instinctive, tendency to perceive the voices of the author and the omniscient narrator as being one and the same. This tendency is even stronger when the narrator is blatantly intrusive, frequently inserting his own opinions into the objective narrative material of the novel. And although there are certainly some novelists who truly intend their narrative voices to be perceived as their own, this is not the case with George Eliot in Adam Bede. In analyzing the narrative voice in this particular novel, I was struck by the almost total agreement, on the part of the critics, that there is a distinction in Eliot's work between the author and the narrator. In fact, Barbara Hardy goes one step further and makes a case for a third category, discriminating between characters who tell their stories, the narrator who does everything but tell his or her story, and the reticent author whose name never appeared on the cover or title-page.! For the purposes of this study, I will be using categories which are basically parallel to Hardy's, though my third category differs somewhat: (1) the author - Mary Ann Evans, (2) the narrator - George Eliot, and (3) the narrative itself. 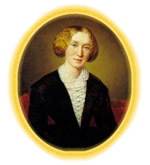 Any serious student of English literature knows that 'George Eliot' is the pseudonym for Mary Ann Evans, but the fact was hardly common knowledge to the readers of Adam Bede in 1859. The newly-published novel was an immediate success, selling thirteen thousand copies in the first year, and two thousand copies in the first month alone. A comment by Elizabeth Gaskell, the Victorian novelist and biographer of Charlotte Bronte, humorously reflects both the mystery of the author and the popularity of the novel: 'I have had the greatest compliment paid me I ever had in my life. I have been suspected of having written Adam Bede'.2 While I do not wish to elaborate on the historical facts surrounding the mystery of the author hiding behind this pen name, it is important to try to understand why Mary Ann Evans chose to let George Eliot narrate Adam Bede, rather than speaking through her own authorial voice. The use of pseudonyms has been fairly common practice throughout the history of English literature, particularly among female writers who felt the need to disguise themselves behind a man's name. Just a decade earlier, the Bronte sisters had published novels and a book of poetry in the names of Acton, Currer and Ellis Bell. Pseudonyms create a situation in which the relationship between the author and the work is reserved, and the fiction creates a reality, rather than reality creating fiction. Or as Michael Ginsburg explains it, 'The author who chooses to use a pseudonym wants to upset the "normal" relationship according to which he is the "father" of his works; he wants to be himself an offspring of his own imagination.